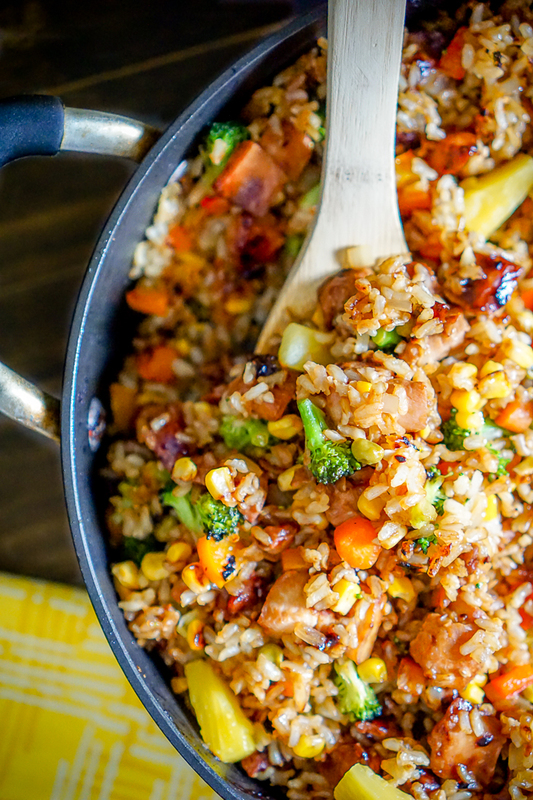 Chicken Teriyaki Fried Rice is filled with veggies and makes a delicious one-pot dinner idea! Every once in awhile, I decide to tackle something brand new that I am nervous about making. The reasons don’t always make sense as to why I am intimidated but fried rice has always been one of those things. 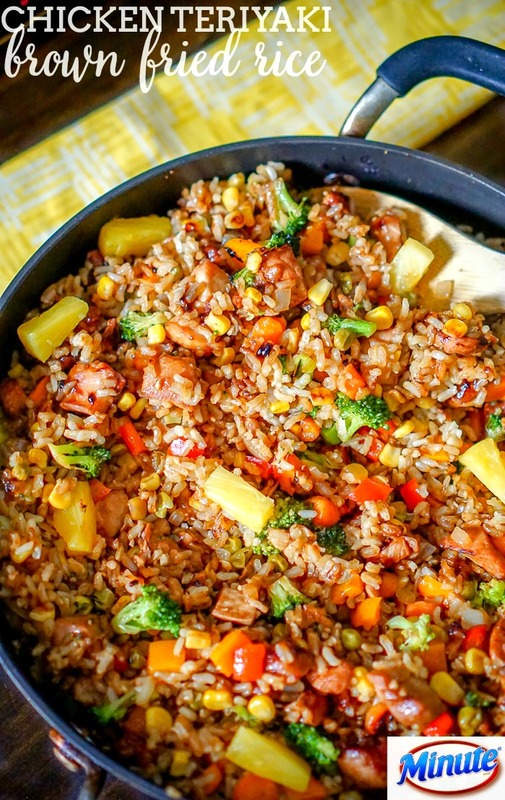 When we haved enjoyed fried rice at home in the past, it came from a frozen bag or a takeout box. But not this time! I was surprised at home simple the process was to make this batch of Chicken Teriyaki Brown Rice compared to what I had built up in my mind. Plus – it was so delicious!! I think we have a new family fave! 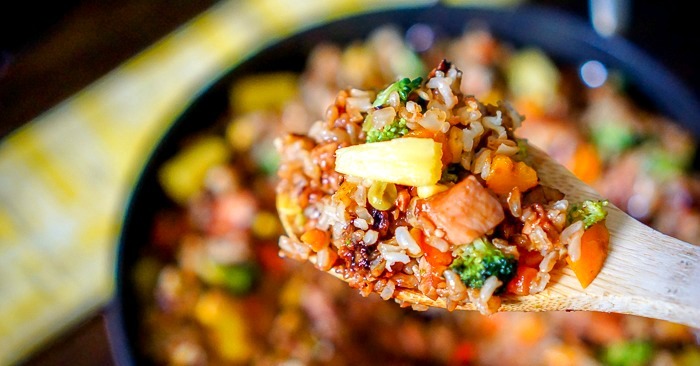 For the base of my Chicken Teriyaki Fried Rice, I used Minute® Brown Rice. Minute® Rice is a staple in our cabinet, and brown rice is definitely my preferred type. It is 100% whole grain brown rice which makes it a nutritious option and it has a rich, nutty flavor. It’s perfect as a side next to your main course which is how we use it more often or as the base for this recipe! Plus, it’s ready in 10 minutes which makes it family friendly for busy weeknight dinners. I know we can all appreciate that. I think what I love most about this recipe is what good leftovers it makes. As someone that works from home, there are only so many peanut butter sandwiches or salads I can eat in a week. It’s fun being able to recook this fried rice for lunch and break the monotony – even if I still have a salad on the side. Plus, this batch gives the two of us multiple dinners and I feel awesome about all the veggies (and even some fruit) that we’re eating. When eating as leftovers, I sometimes microwave (more when I’m in a rush) or I add a real thin layer of olive oil to a skillet and lightly cook the recipe up again until warm. Marinate chicken in 1/2 c of teriyaki sauce for at least 30 minutes. Add chicken and teriyaki sauce into skillet and cook thoroughly until chicken is no longer pink. Set aside. Heat thin layer of oil in a large deep skillet over medium-high heat (I use same skillet). Add carrots, onions, broccoli, bell pepper, and garlic and saute 5 minutes. Add rice, peas, corn, and remaining teriyaki sauce - cook and toss for a few minutes. Add chicken and pineapple plus a little olive oil to the bottom of the pan to lightly fry the rice. Let the mixture sit for a few minutes, flip, and repeat until you reach desired crispy-ness. If you like this recipe and cooking with Minute® Rice like I do, then make sure you join the The Riceipe Club®. You will get lots of recipe ideas and special offers sent straight to your inbox! 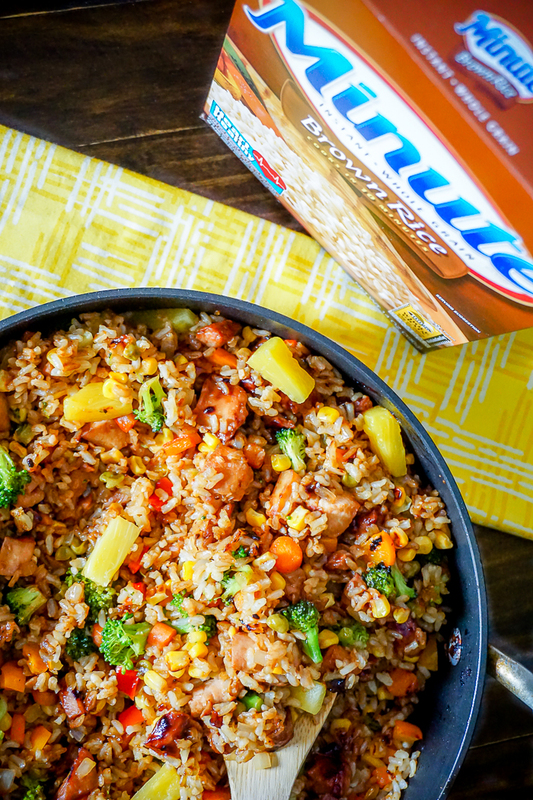 Plus, make sure you follow along with Minute® Rice on Facebook, Twitter and Pinterest.